I’m tempted to post a blank page. Nothing goes right today. Chef shows us how to truss a chicken. It’s complicated. Firstly, take off the wings and the parson’s nose. Put a slit in the skin to remove the wish bone. Put the trussing needle in at the thigh, out through the other side under the drum stick, take the string around the drum stick, through the breast, flip the bird, put running stitches across the back bone, through the wing, turn over again etc etc. I make a start. It doesn’t seem right. Chef is making his way around the kitchen helping with the trussing. By the time he gets to me, I have put the slit in the wrong place to get the wish bone out so I don’t have enough skin to cover the end of the bird. It’s deflating knowing that I have started the day with a mistake that is going to seriously affect my presentation. I tell myself that you learn by your mistakes, but there’s such a strong emphasis on the marks that there’s no room for mistakes. Anyway, the chicken’s in the oven and I’m basting it religiously. It’s looking succulent and juicy and is browning perfectly. The aroma of 13 trussed tarragon-stuffed chickens fills the kitchen. 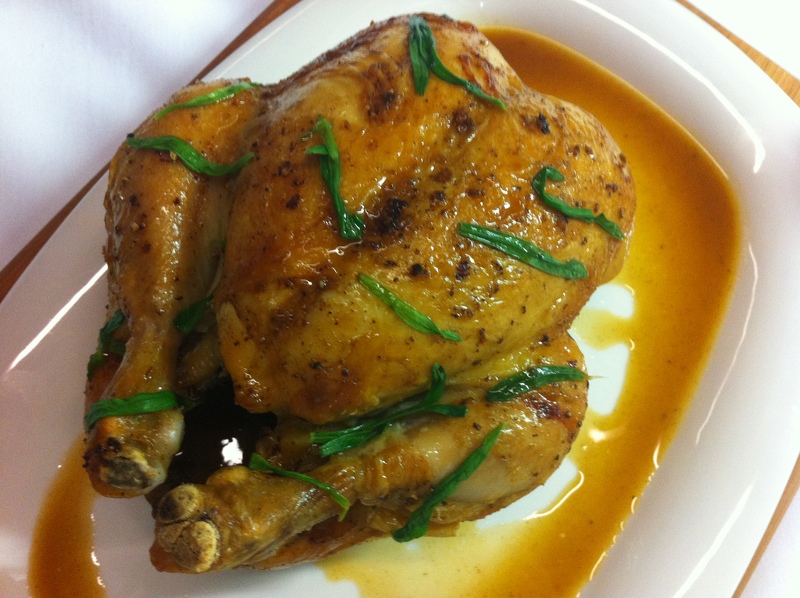 We’re serving the whole chicken with a tarragon sauce and pommes William. 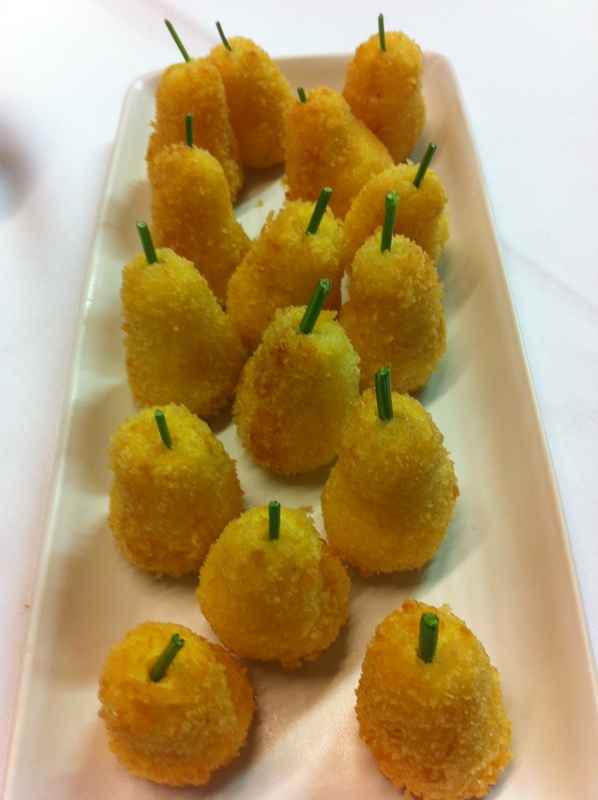 These are pureed potatoes shaped into a baby pear, deep fried and served with a parsley stalk poked in the top. Chef advises us to test one in the deep fryer before we cook them all. I do so and it’s a perfect crunchy morsel that I can’t resist eating immediately. The chicken’s done and I’ve spread the blanched tarragon over it. The sauce has been sieved and checked for seasoning and it’s spot on. I head to the deep fryer and plunge in the potatoes. Every single one of my pommes William’s breaks open. A couple are just salvageable. There seems no explanation why the test was perfect and the real event, a disaster. Maybe the temperature of the fryer has dropped following use by the other students. Who knows. I’m flustered but I have to plate up and take the food to Chef for assessment. We discuss the pomme Williams. They taste great even though they are split. Chef goes to cut into the chicken. “Bit stringy”. How can such a succulent looking bird be stringy? Hah. I have forgotten to take the trussing string off the bird. I’m glad class is over. Doesn’t sound like you have had too many bad days H! Keep your head up. At least your not covered in pumpkin soup again! We all have days that we’d rather not have. Seems to me you might be being a bit hard on yourself. It’s the practice that makes perfect. I think you are doing brilliantly to keep up with it all and then come home and save us from staring at a blank page. Thanks for sharing these adventures. Keep breathing, you’re almost there and you’re doing so well. Thanks for your encouragement Julie. From day one it has been a roller coaster, and I have to admit there are now more ups than downs. You may have had a rough day, but as usual the food looks delicious! You have been incredibly dedicated to get this far and this is just one of those days to put behind you and look forward to the next challenge.